Note: GM's declining numbers were affected by the sale of its European division to PSA Group last year. 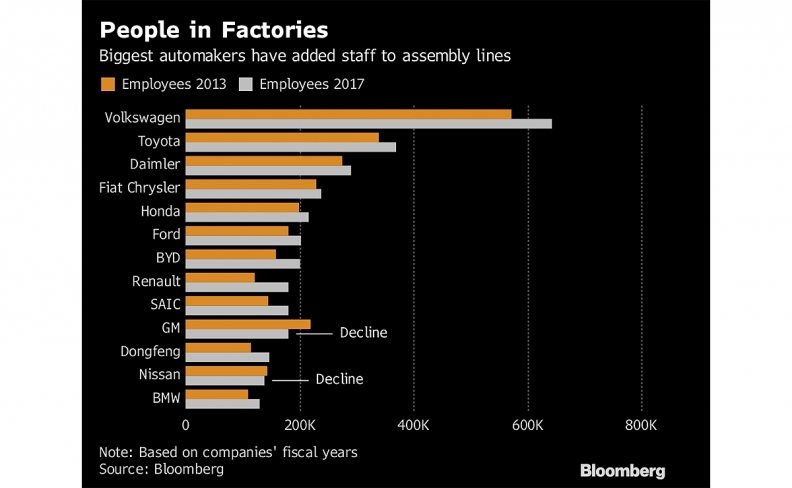 Of the 13 publicly traded automakers with at least 100,000 workers at the end of their most-recent fiscal year, 11 had more staff compared with year-end 2013, according to data compiled by Bloomberg. Combined, they had 3.1 million employees, or 11 per cent more than four years earlier, the data show. Carmakers in China and other emerging markets, where growth is strongest, favor human labor because it requires less upfront investment, said Steve Man, an analyst at Bloomberg Intelligence in Hong Kong. In developed markets, tasks that can be handled by robots have already been automated years ago and automakers are now boosting hiring in r&d as the industry evolves. A trio of Chinese automakers, SAIC Motor Corp., Dongfeng Motor Group and BYD Co. -- in which Warren Buffett is a major investor -- increased staff by at least 24 per cent. Volkswagen Group accounted for more than one in five jobs among the group of 13, and increased its employee count by 12 per cent in the period. General Motors, which shrank its payroll 18 per cent to 180,000, and Nissan Motor Co., which contracted by 2.8 per cent to 139,000 workers, were the sole carmakers whose staffs got smaller, the data show. But GM’s numbers were affected by the sale of its European division to PSA Group last year. About 40 per cent of autoworkers were women in 2017, compared with 38 per cent four years earlier, based on data from about 30 of the largest vehicle producers worldwide. The analysis didn’t take into account wages or location of the workers. Total vehicle production worldwide in 2017 rose 11 per cent to 97 million units, compared with 2013. Chinese plants cranked out 30 per cent of all vehicles last year, followed by 12 per cent in the U.S., 10 per cent in Japan, six per cent in Germany and five per cent in India. Global vehicle sales totalled 85 million units last year, an increase of 11 per cent from 2013. Half of those sales last year were in the Asia-Pacific region, a slight uptick because the proportion from Latin America fell from four years earlier with demand waning in Brazil.